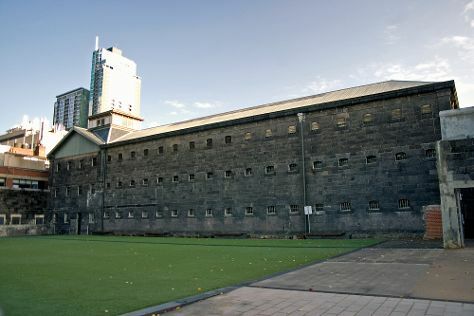 Attractions like Old Melbourne Gaol and Werribee Open Range Zoo make great kid-friendly stops. Deepen your sense of the past at sights like Shrine of Remembrance and Parliament House of Victoria. Step out of Melbourne to go to Ballarat and see Sovereign Hill, which is approximately 2 hours away. On the 10th (Wed), give your taste buds a day to remember with a local gastronomic tour. The adventure continues: tour the pleasant surroundings at Melbourne Zoo, take in nature's colorful creations at Royal Botanic Gardens, pause for some serene contemplation at St Paul's Cathedral, and take in panoramic vistas at Eureka Skydeck 88. To see maps, other places to visit, and tourist information, use the Melbourne trip itinerary app . Use the Route module to find suitable travel options from your home destination to Melbourne. April in Melbourne sees daily highs of 23°C and lows of 11°C at night. Finish up your sightseeing early on the 11th (Thu) so you can travel to Gold Coast. 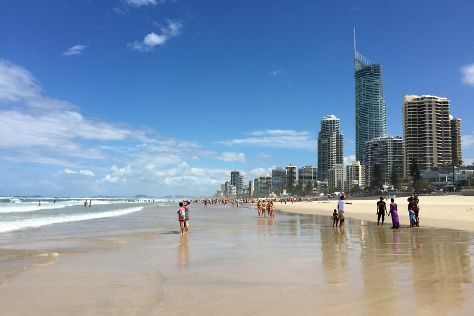 You'll get in some beach time at Surfer's Paradise Beach and Coolangatta Beach. Get in touch with nature at Burleigh Heads Beach and Burleigh Head National Park. Next up on the itinerary: find something for the whole family at Sea World Theme Park. To see maps, other places to visit, more things to do, and other tourist information, you can read our Gold Coast journey planner . Getting from Melbourne to Gold Coast by flight takes about 4.5 hours. Other options: do a combination of flight and train; or drive. Traveling from Melbourne in April, things will get a bit warmer in Gold Coast: highs are around 30°C and lows about 19°C. Wrap up your sightseeing on the 14th (Sun) early enough to travel to Port Douglas. Family-friendly places like Palm Cove Beach and Trinity Beach will thrill your kids. Get in touch with nature at Scuba & Snorkeling and Safaris. Change things up with these side-trips from Port Douglas: Cape Tribulation (Daintree Entomological museum, Myall Beach, & more) and Cairns (St Monica's Cathedral & Esplanade Boardwalk). There's much more to do: experience rural life at Hartley's Crocodile Adventures, look for gifts at The Reef Marina, enjoy the sand and surf at Wonga Beach, and learn about winemaking at Shannonvale Tropical Fruit Winery. To see maps, photos, where to stay, and more tourist information, go to the Port Douglas day trip planning website . You can do a combination of flight and shuttle from Gold Coast to Port Douglas in 6.5 hours. Alternatively, you can do a combination of train, flight, and shuttle; or drive. Plan for a bit warmer temperatures traveling from Gold Coast in April, with highs in Port Douglas at 34°C and lows at 25°C. Finish up your sightseeing early on the 21st (Sun) so you can travel back home.